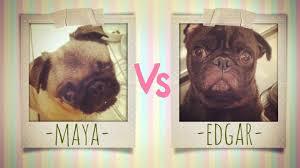 MAYA VS EDGAR is a video about the pets, two pugs specifically, of youtube star CutiePieMarzia and her boyfriend PEWDIEPIE, He has 24,000,000 subscribers but he uses bad language a lot which is not very nice so I prefer CutiePieMarzia and Maya! One of my favorite funny dog videos! 2,000,000 people agree with me! Maya and Edgar confront each other to determinate who is the master pug!